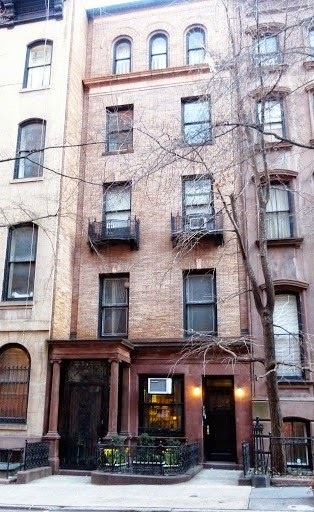 On the afternoon of December 9, 1887 Mrs. A. D. Jaxon held “a private cake sale” in her brownstone home at No. 120 East 37th Street to raise money “to support a bed in the Baby’s Hospital” on Lexington Avenue and 45th Street. The Murray Hill house had been built only about 30 years earlier; but it would not last many more years. By 1891 it was owned by John D. Hewlett and on July 3 that year the Real Estate Record & Builders’ Guide reported that he had sold it to James Fargo. There were two well-to-do James Fargos in Manhattan at the time; this one was James Francis Fargo, Treasurer of the American Express Co. and a trustee in the American Savings Bank. Fargo’s father, James C. Fargo, was perhaps more well-known. In 1844 he had joined the Wells & Co. express firm, of which his brother was a partner. That firm would become Wells Fargo. By 1881 he was President of the American Express Co. and both his sons—James and William—were involved in the firm. James F. Fargo had married Jane Lindley King in a fashionable St. Thomas Church wedding on May 17, 1881. Now, ten years later, he planned a stylish new home for his wife and their four children. It would be another decade before the trend in Murray Hill to raze or remodel the old brownstones into up-to-date mansions really took hold. But in this respect James F. Fargo was ahead of his time. He had the old four-story rowhouse demolished and commissioned the architectural firm of Romeyn & Stevens to design its replacement. Construction started the same year and was completed in 1892. The staid block of identical Italianate brownstones suddenly had a showstopper. The high stone stoop was eliminated and the doors (a main entrance and a service door) were at sidewalk level. A handsome brownstone portico supported by Ionic columns distinguished the stone base. Above, four floors of ironspot brick carried out the Renaissance Revival motif. Understated and formal, the design featured two decorative iron balconies at the third floor and above the fourth floor cornice a trio of eye-catching arched openings. Initially joining the family in the house was Mrs. Fargo’s sister, Mary Franklin King. Three years after moving in, Mary married George A. Heyl Churchill at noon on November 21, 1894. The wedding took place just steps away from the house in the Church of the Epiphany at Lexington Avenue and 35th Street. Young Grace Fargo was her aunt’s maid of honor. Following the ceremony the reception was held in the Fargo home. At the turn of the century the debuts of the teenaged Fargo girls were not far off. Like all society mothers, Jane Fargo prepared them for social interaction. One way was to host entertainments aimed at people their own age. On the evening of April 12, 1901 Jane gave “a large card party for young people.” Three years later the 37th Street house would be the scene of receptions and other entertainments as Grace was introduced to society. The Fargo family, like all moneyed New Yorkers, would shutter their Murray Hill home and escape to a summer home. Theirs was at Monmouth Beach in New Jersey. Two years later, on November 27, 1908, Clara Fargo was introduced to society at an afternoon reception in the house. Assisting in receiving was Grace, who was now living in Washington. It would be one of Grace’s last social appearances before her husband was killed in a polo accident. Despite the tragic death of Daniel Chauncey, life went forward in the Fargo household. In 1909 wealthy Americans made statements with their expensive automobiles. When the Yale-Harvard football game was played that year, it was a chance to show off shiny limousines and touring cars as the families arrived in New Haven to show support to their sons in both exclusive schools. On November 14, 1909 The New York Times estimated a “thousand or more parties of automobilists” and said “There were apparently more automobilists than pedestrians…Many fashionable New Yorkers were present, all arrayed in their brightest attire, the Yale blue being pleasantly contrasted with the orange and black of Old Nassau. Among the throng were James F. Fargo, along with Jane and Clara who “motored to New Haven in their Packard, and were in the Yale stand.” The family sat among the Yale supporters because son James C. Fargo was a Yale man. The awkward problem was that his brother, Stanley, attended Harvard. Jane Fargo was therefore diplomatic in her attire. “Mrs. Fargo, who has a son, Stanley Fargo, at Harvard, wore a large American beauty rose in her corsage.” There were no school colors in Jane Fargo's wardrobe that afternoon. The year 1915 was momentous for the family in several respects. James and Jane announced that Clara would remarry, having become engaged to wealthy businessman Harry A. Curtis. On February 7 Fargo's father, James C. Fargo, died at the age of 86; and with the outbreak of war across the ocean 27-year old James C. Fargo 2nd joined the U.S. Army’s Company F, 1st Training Regiment. By now the Fargo family no longer summered in New Jersey. They maintained a magnificent estate in Westchester County of over 70 acres. But with the children grown and gone, in 1923 the 66-year old Fargo began downsizing. On February 23 that year he sold the country estate to Mrs. Beatrice Carlender, and on Christmas Day The New York Times reported that Dr. Herman Friedel had purchased the 37th Street house. In reporting the sale, the newspaper confused James Fargo and his brother. “The dwelling was built some years ago by Wm. C. Fargo, Treasurer of the American Express Company, for his own occupancy and is still occupied by him.” The newspaper added that Friedel “has made this purchase as a Christmas gift for Mrs. Friedel. The Christmas gift did not entail the Friedels living in the entire mansion. Within a year the house had been converted to a doctor’s office and triplex on the first through third floors, two “non-housekeeping apartments” on the fourth floor, and a “housekeeping apartment” on the fifth. The Fargo house continued its role as doctor’s office and upscale apartments throughout the century. The socially-visible Mr. and Mrs. Frederick H. Allen lived here in 1938 when their son was born; and Broadway stage producer Daniel Dody was here at the time of his death in May 1952. A conversion in 1955 resulted in two apartments each on the third and fourth floors; but the exterior appearance of the Fargo house remains remarkably unchanged since 1892.